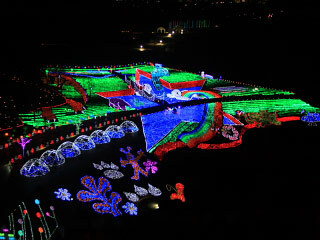 The Winter Illumination of Tokyo German Village is one of three major winter illumination in Kanto region. Every year, they have different concepts of the decoration. Therefore, it always gives you new impression. You can enter by your car, so it is very convenient for family with kids and seniors. Note: The park has no street light. So, be careful when you walk around. No pet. Be careful for driving. Only a Ferries wheel is available at night.